LEFTOVERS : Red and white dust coats the ground at the Klau/Buena Vista Mine outside Paso Robles. The color comes from iron oxides and mineral salts left from contaminated runoff from mercury mine tailings. Wind rustled short stalks of dry, brown grass at the abandoned mercury mine just outside of Paso Robles. What used to be 320 acres of mercury mining operations is now known as the “Klau/Buena Vista Mine” and it’s the site of a federal attempt to keep mercury from spreading more than it already has. The derelict site, a relic of the mercury mining boom when gold was plentiful, looks like a ghost town. Grass spread around old rusted buildings and a stripped-down pickup truck. During a recent visit, gusts grabbed loose sheet metal roofing and repeatedly slapped it down, sending a rhythmic “thwack” bouncing through the small valley. 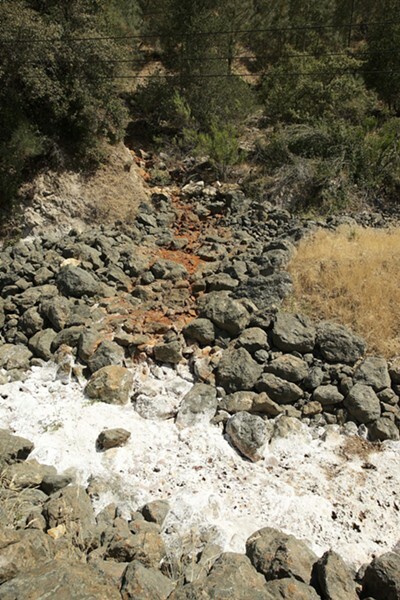 Mineral salts, heavy metals, and iron oxides left by contaminated runoff had turned much of the ground a strange marbled red-and-white color. “I wouldn’t kick up a lot of dust,” Jim Sickles warned a visitor on a recent tour. Sickles is a project manager for the U.S. Environmental Protection Agency, the agency taking lead in the cleanup effort for the Buena Vista Mine. There was more to the gold rush than just gold. While some prospectors were panning on riverbanks and blowing holes in the sides of hills, others were scouring for mercury. Mercury is glue for gold; the heavy quicksilver liquid clings to gold flakes, which made it invaluable during the height of the gold rush. Unfortunately, it’s also a neurotoxin in humans that stunts mental development. Miners gathered gold in the Sierra Nevadas using mercury mined from the hills along California’s coast. Mercury mining was the economic backbone of Cambria during the gold rush. The market continued to thrive when the element was used in weapon trigger mechanisms during both world wars, the Korean War, and the Vietnam War. There are no active mercury mines in the United States today; the market died in the early 1970s. Some of the mines were properly sealed and cleaned. Some, among them the Buena Vista, are in the process of being cleaned up. Most have been abandoned without any remediation. According to the best estimates, there are 236 mercury mines in California, with dozens peppered along the Central Coast. One of them helps explain why so many mines aren’t being cleaned. Far east of Cambria, there’s a small organic farm hidden at the base of steep surrounding hills. Traveling there is like stepping back in time. Goats meander beside a winding county road that looks as though it were a roll of asphalt unwound like a carpet across the valley floor. The farm’s location is called Charan Springs but was once better known as the Oceanic Mine. On a recent visit, which proceeded no farther than the front gate, chickens were softly warbling behind a few scattered orange trees. There was a pile of discarded couches; there were flatbed trailers, junk televisions, and rusted chairs strewn along a gravel road leading to the farm. The mine’s name has faded, but the mercury remains. Decades passed, the mine closed, and its ownership changed many times. The problems, though, didn’t go away. WATERBORNE : Water board officials found elevated mercury levels in Curti Creek 12 years ago. Mine waste from the Oceanic Mine, now the Charan Springs Farm, was identified as the source but there’s been no cleanup at the site. 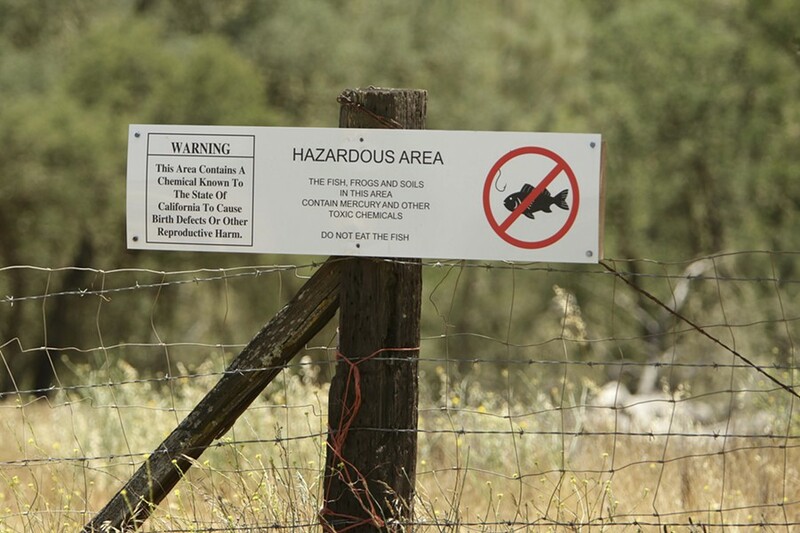 Michael Limacher knows miners processed mercury ore on his property, the Charan Springs Farm, where cultivation was abruptly halted in late 1996 after mercury was discovered in lettuce and spinach grown there. A few months after the contamination was discovered, the Central Coast Regional Water Quality Control Board sent a cleanup order to former owner Robert Featherston. Featherston was supposed to correct the problem within about six months. He didn’t. Featherston sold the property, and it was sold again and again. Three people share ownership now. Limacher lives there, which means he has inherited the legal responsibility for the cleanup, but he has no plans to comply. New Times wasn’t allowed to tour the farm. During a second attempt to get permission for a tour, Limacher made it clear he didn’t want reporters to return. What about the cleanup order? He didn’t create the mess. That’s the problem with enforcing cleanup orders: The miners who caused the pollution are dead and the person responsible is whoever owns the property for which the cleanup order is issued. Rick Humphreys is a geologist with the State Water Resources Control Board who specializes in water contamination from old mines. Although his job centers on cleaning and containing hazardous sites, even Humphreys said it’s hard to do so without looking like a bully. “The state looks kind of bad when there’s some old person with no resources,” Humphreys said. “… The private property sites are problematic and about the only way we’ve had success is when the regional [water] boards have been able to go back and find a responsible party.” A responsible party is anyone with some stake in the actual mine. David Schwartzbart, an engineering geologist for the Central Coast region of the State Water Resources Control Board, helped test some of the watersheds in the northwestern parts of the county in 1996. He found high mercury concentrations in Curti Creek, which flows from the Oceanic Mine site into Santa Rosa Creek, into the Pacific Ocean, and into the Santa Rosa Valley groundwater basin, which prompted the cleanup order. Schwartzbart’s a stout man with a leathered face hidden behind a thick patch of black-and-gray whiskers. He’s worked as a geologist for nearly 30 years. In the 1996 study, still the most recent county data, he evaluated seven mines (five mercury and two chromite). The study could have been expanded to 23 area mines, but was restricted because of limited time and money. The study also pointed out that even long-time residents can be unaware they live on old mines. The few people with knowledge of the mines are elderly, and when they die, so will the county’s mining history. Hundreds of inactive mines that could pollute groundwater and seawater with toxic metals smack of an environmental nightmare. Surprisingly, the attitude of state and federal regulators seems almost blasé. Many of them told New Times small mercury mines could be problems, but doubted they are. But not all mines have been studied nor have their cumulative effects. Inactive mercury mines aren’t like an oil tanker bursting with disastrous consequences; they may have been hazards for more than a century. If human health hasn’t clearly suffered—a cancer outbreak, for example—there’s no urgent threat to force a cleanup. The Klau/Buena Vista Mine posed an immediate danger, but many other mines have not, so far. When responsibility can’t be determined there’s usually no cleanup. Schwartzbart said polluters like the Oceanic Mine could easily cost $500,000 or more to abate. There’s no funding or program to track all the mines and analyze environmental hazards, Schwartzbart said. Inevitably, the property owner is stuck with the bill, but it could cost the state a prohibitive amount to enforce a cleanup. DON’T EAT THE FISH : Mercury moves from mines to humans through fish. Fish can accumulate toxic levels of mercury in their muscle tissue which is dangerous to humans when the fish are eaten. •The contamination gets so bad there is an immediate threat to humans, or neighbors complain, and the Environmental Protection Agency steps in. But EPA resources also are limited, and the agency can target only the most egregious polluters. •The mine crosses federal or state property and EPA steps in. •The property owner agrees to do the work but can’t afford it and quits, and EPA steps in. The Klau/Buena Vista mine produced two million pounds of mercury since 1868. It continued to leak mercury into Lake Nacimiento even after production stopped. Today, the lake is one of nine in California under a state health advisory. Federal officials from EPA are in the middle of cleaning the mine, and there are warnings posted at all the water bodies that flow from the site. Water quality isn’t so much a concern as the fish that can accumulate mercury to toxic levels over time, which humans can ingest. Touring the Buena Vista mine with Sickles was like a house tour where the owner is always making improvements and wants to explain everything. But instead of new kitchen tile, Sickles reminisced about hauling more than 130,000 cubic yards of processed ore from the creek bed to the top of the hill, and digging large sedimentation ponds to collect contaminated water runoff. EPA has spent about $6 million so far to contain the dangerous runoff from the Klau/Buena Vista. The owner, Buena Vista Mines, Inc., began the effort after years of court battles with the state water board. Shortly after the cleanup started, it became too expensive and the mining company quit. EPA was contacted in 2000. EPA cleanups are dictated by a federal priority list. Such projects are paid for by an EPA superfund. In California, there are about a dozen mercury mine cleanups funded by EPA. By the time they’re done at Klau/Buena Vista, Sickles said, the price tag could easily top $10 million. Much work has been accomplished but more remains. For example, a cleanup plan for the long term should be ready later this year. So far, EPA has contained about 80 percent of the contamination during the initial, short-term phase of work, Sickles said. Mercury becomes hazardous after it’s extracted from ore and leaks into water. Most mercury clings to sediment and gets picked up by small mud-dwelling organisms. Fish that eat the contaminated organisms end up with mercury in their muscle tissue. When humans eat enough fish they, too, can accumulate toxic doses. In sufficient doses, mercury is a neurotoxin to humans and other mammals. Developing fetuses are vulnerable when their mothers eat contaminated fish, explained Susan Klasing, who studies fish and water quality for the state Office of Environmental Health Hazard Assessment (commonly referred to as OEHHA and pronounced “o’ wee ha”). “It is toxic at very low levels,” she said. At such levels the effects are subtle, Klasing said. Human mercury poisoning is manifested in attention deficits or other learning difficulties, for example. The element has been shown to be toxic to other mammals and possibly fish-eating birds. SLO COUNTY’S LARGEST MINES: Klau/Buena Vista Mine: Two million pounds of mercury since 1868. Rinconada Mercury Mine: 228,000 pounds of mercury since 1872. Inactive mercury mines and other mining relics left to fester in California have slipped through a legislative loophole. New mineral mines fall under stringent contemporary regulations. Old mines, on the other hand, are still dictated by the Mining Act of 1872. There have been a few minor revisions to the act, but never provisions to pay for cleaning inactive mines. Unlike oil and similar industries, active mineral mining companies don’t pay a fee toward cleaning old messes. Senator Dianne Feinstein has made inactive mine cleanup a priority. She created a program that’s developed the most comprehensive list of inactive mines to date. 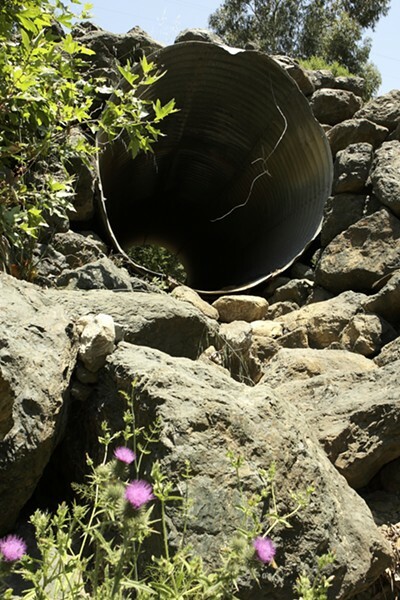 It’s commonly called the Feinstein list, and catalogs more than 47,000 abandoned mines in California, more than 500,000 nationwide. Feinstein introduced legislation last year to reform the Mining Act, but it stalled and died in committee. She introduced a similar bill this year: the Abandoned Mines Reclamation Act of 2009. If it passes, it will create an abandoned-mine cleanup fund, an inventory of abandoned mines, and a .3 percent fee on new mining operations to pay all the costs. Charlie Alpers is a scientist with the United States Geological Society and one of the foremost experts on mercury use during the gold rush. He said there are 236 known mercury mines recorded in California. Most of the biggest polluters have been identified, he said. The top dozen known polluters probably account for 99 percent of the contamination. The smaller ones are less of a concern, which is good because nobody is throwing money to evaluate and clean them. It’s not as though anyone can just grab the records of every mine ever dug in California. In SLO County, such records didn’t even exist until well after most of the mines ceased production. As a kid, County Environmental Resource Specialist Jeff Oliveira lived on a ranch where there was an abandoned mercury mine. Old mines were an inconspicuous part of the landscape. Some ranchers reopened mines to supplement their income. Things changed when state officials began requiring permits for old mines in the early ’70s, Oliveira said. “But that was only for people that wanted to keep their mines open. Maybe the regulations aren’t so thick after all. Finding and cleaning old mines is fluid and chaotic, no more consistent than mercury itself. Staff Writer Colin Rigley can be reached at crigley@newtimesslo.com.